I have seasonal depression. The fact that it’s cold at night now and the temperatures fluctuate drastically from day to day and I have to actually check the weather to see what I should be wearing saddens me. I hate that summer is over. I hate it. But like every year at this time, I’m happy that football is back. The first week of football is special and the anxiousness at 1:00 on the first Sunday of the season is indescribable. Keeping up with the games, parlays, teasers and fantasy teams all at once, while drinking and eating thousands of bad calories for nearly 11 straight hours 17 times a year is magical. Week 1 is my favorite week to pick and wager on because your decision making is based on your own knowledge and feel for how the season will play out. Week 2, on the other hand, is a reaction and a lot of times an overreaction to what happened in Week 1. If I could, I would sit out Week 2. Unfortunately, that’s not an option. But we have a whole slate of games before we get to the eventual disaster that awaits next week. For now, it’s the best week of the season: Week 1. I’m still not over the Falcons’ Super Bowl loss. Dan Quinn should have been fired after the Falcons’ Super Bowl collapse and loss two years ago the same way his former head coach Pete Carroll should have been fired for his goal-line decision two years before that. If you’re the owner of the Falcons, you simply can’t trust Quinn after the way he mismanaged the clock and stopped running the ball altogether in that game. The Falcons will never have that kind of lead in the Super Bowl ever again and if you can’t trust coach to take it home with a 25-point lead in the third quarter, how can you ever trust him in any other game? I realize saying all of this makes it seems like me picking the Falcons is a typo but it’s not. I would like to think that the Falcons learned from the worst collapse of all time and learned from their absurd red-zone play calling in the playoffs against the Eagles eight months ago, which eliminated his team from the postseason. This has to be the Falcons coaching staff’s last chance to figure it out as the Falcons’ window of opportunity is closing fast. As for the Eagles, I have only ever rooted for them once in my life and that was in the Super Bowl. Barring the same matchup in a future Super Bowl, I will never root for them again. I can see the Eagles having a disappointing season following a championship because it just makes too much sense for them not to. But at the same time I want Nick Foles to succeed to cause the greatest quarterback controversy in history and tear the team and its fan base apart. No, this isn’t a Hard Knocks pick. Because if I learned anything from Hard Knocks it’s that Hue Jackson should no longer be the Browns head coach. I have no idea how any player can listen to or respect a coach who has gone 1-31 over the last two seasons. And while he wasn’t exactly given the best rosters to work with, he’s still the head coach of both a 1-15 and 0-16 team, and it will be very easy for his players to tune him out if this season doesn’t start well. But Jackson is likely still the head coach because it’s hard to sell any well-respect coaching candidate on taking the Browns job right now. Anyone with success who is in the mix for a head coaching job isn’t about to take the Cleveland job and ruin their career. So for now, Jackson gets to keep his job and gets to wear jeans when he lets players know they are being released. This pick isn’t about that much-improved Browns. It’s more about the overrated Steelers. I understand the Steelers, like the Cowboys, enjoy an inflated line because of their national following, but the Steelers aren’t good. I don’t even think they are a playoff team this season. This season is the end for Mike Tomlin in Pittsburgh and it starts in Week 1 with a poor showing in Cleveland. The Giants first-half schedule is possibly the hardest schedule ever created in the history of the NFL. It’s hard to say the Giants should beat a true Super Bowl contender in Week 1, but they kind of have to if they want to avoid losing their season before it even begins with their schedule. I don’t know how the offensive line is going to hold up against the Jaguars defense or how the Giants defense is going to handle Leonard Fournette or what to expect from Pat Shurmur as head coach, but it all better work out. The Titans were a playoff team last year and the Dolphins were one the year before and might have been again last season if not for having to play Jay Cutler.. Yet, this game feels like an absolute borefest. Nathan Peterman is starting for the Bills. That doesn’t seem like a great idea given his performance last season. The Texans nearly, and should have, pulled off the upset on the road against the Patriots last season. This pick is more about me not wanting the Patriots to win and win big than it is that I actually think the Texans will win or cover. I watched the NFC Championship Game with Brittni in a bar across from the Staples Center before Rangers-Kings. After the Vikings’ opening-drive touchdown I was so mad I hadn’t put even more money on the Vikings than I had. But as the game went on and I watched Brittni’s mood decline, I was happy I only gave back all the money Stefon Diggs had won me the week before and a little more. The Vikings were a final four team with Case Keenum as their quarterback and without Dalvin Cook for nearly the entire season. I’m not the biggest Kirk Cousins fans, but he’s certainly better than Keenum and Cook is back from his ACL injury, and the Vikings defense will be as good as it has been now for the last three seasons. The teaser was originally a six-team teaser with NO -3, but after looking back at their home games last year, I remember too many times needing them to score late to cover for me (especially in their win over the Jets) that I decided to remove them. I still think they will win big against the Bucs and I still think they are once again a playoff team this season, but the Superdome Saints can’t be trusted the way they could a few years ago, and I don’t want them destroying that teaser. I had to look up to see if Marvin Lewis is still the head coach in Cincinnati, and he is. This is his 15th season as head coach of the Bengals and he has as many career playoff wins as me. How is that not an issue for Bengals ownership? Why are NFL owners so soft when it comes to changing the person responsible for running their multi-billion-dollar business? I originally wrote KANSAS CITY +3 over San Diego and several times this week I tried to look up the Chargers schedule by searching for San Diego. It’s like after the New Year when you continue to write the previous year except that only last a few days or maybe a week. The Chargers have now played a full season in Los Angeles and my brain still thinks they play in San Diego. I’m starting to realize why they don’t have a fan base. The Cowboys are going to be bad. Very, very, very, very bad. And it makes me giddy just thinking about how bad they are going to be. Jason Witten retired, they released Dez Bryant and Dan Bailey, they’re without their best offensive lineman, their quarterback can’t throw the ball more than seven yards and their No. 1 receiver is Cole Beasley. I wish you could see the smile on my face while typing this paragraph. I have never been an Alex Smith fan, but he’s not bad. He takes care of the ball, makes good decisions for the most part and is reliable. He’s basically the opposite of Sam Bradford. It’s too bad the Seahawks have gradually regressed since Pete Carroll made the worst call in sports history on the goal line in the Super Bowl. (Yes, that’s the second Pete Carroll Super Bowl disaster reference in these picks. I will never pass up a chance to reference that decision.) The Seahawks were a Marshawn Lynch one-yard run away from winning back-to-back Super Bowls. Instead they lost the Super Bowl, thanks to their coach, lost in the divisional round the next season, lost in the first round the season after that and missed the playoffs last season. Now, the Seahawks look like they will have their worst team in a decade. That’s too bad. This has trap game written all over it. Between being a division game in primetime and having a touchdown-plus spread to being the last thing I will potentially need to hit to win my five-team teaser, I’m petrified of this game. But I know if I pick the Bears to cover and they go down 7-0 two minutes into the game in an eventual blowout, I will be way more angry at myself than if they’re somehow able to keep it close and cover. I wanted the Giants to draft Sam Darnold. It’s not that I think Eli Manning is done or that it’s time to move on. It’s that the Giants should have drafted under the premise that they won’t be drafting second overall again for a long, long time, and when there is a possible generational talent available like Darnold, you take him, groom him and then turn the team over to him. 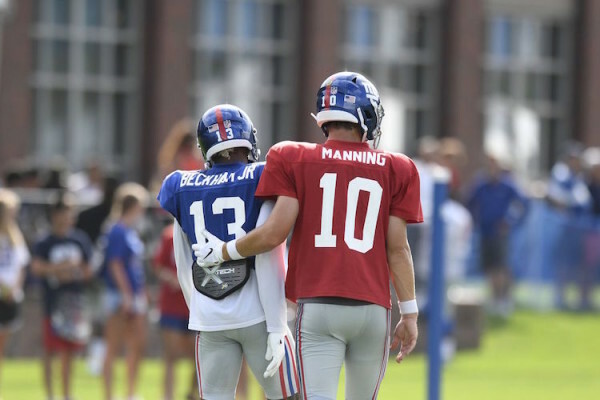 But since the front office decided Manning still has a few years left, it would have only caused a weekly shitstorm every time the Giants lost with fans calling for Darnold to start. I think once it was decided Manning could still play, the organization wasn’t about to create their own media relations circus. I hate the Jets, but I’m rooting for Darnold. Raiders fans are nostalgic for the return of John Gruden, but I don’t think that will last long. Following Gruden forcing Khalil Mack out of Oakland in his prime, Gruden approval rating leash got very short even if he does have a decade-long deal to run the Raiders. The moment Gruden’s hiring was announced I felt it would eventually turn into a disaster and the process started before he even coached a game.